a. Nationality: The candidate must be a Bangladeshi citizen. b. Educational Qualification: Candidate must pass the Class 6/Equivalent final examination. a. Previously in the cadet college test exam pass. b. Written, oral and health tested are If ineligible. c. Gross Knock Knee, Flat Foot, Colour Blind, Over Weight. d. Asthma, Epilepsy, Heart Disease, Arthritis, Rheumatic Fever, Tuberculosis, Chronic Dysentery, Hepatitis, Duodenal Ulcer,Night Blindness,Diabetes, Hemophilia. c. Address: Principal, Faujdarhat Cadet College, P/O: Faujdarhat Cadet College, Chittagong-4316. c. Address: Principal, Jhenidah Cadet College, P/O: Jhenidah Cadet College, Jhenidah-7301. b. Exam Center: Bindu Basaini Govt. boys High School (boys) and Bindu Basaini Govt. girls High School (girls), Tangail. c. Address: Principal, Mirzapur Cadet College, P/O: Mirzapur Cadet College, Tangail-1942. b. Exam Center: Rajshahi Cadet College (boys and girls) and Adamji Cantonment College (boys), Dhaka Cantonment. c. Address: Principal, Rajshahi Cadet College, P/O:Sarda, Rajshahi-6271. b. Exam Center: Sylhet Cadet College (boys and girls) and Shahid Bir Uttam (Lt) Anowar Girl's School & College (Girls), Dhaka Cantonment. c. Address: Principal, Sylhet Cadet College, P/O:Sylhet Cadet College, Sylhet-3101. b. Exam Center: Sylhet Cadet College (boys and girls) and Cantonment Public School & College (boys and girls),Rangpur. c. Address: Principal, Rangpur Cadet College, P/O:Rangpur Cadet College, Rangpur-5404. b. Exam Center: Barisal Cadet College. c. Address: Principal, Barisal Cadet College, P/O:Barisal Cadet College, Barisal-8216. b. Exam Center: Pabna Cadet College (boys and girls) and Adamji Cantonment College (boys), Dhaka Cantonment. c. Address: Principal, Pabna Cadet College, P/O:Pabna Cadet College, Pabna-6600. b. Exam Center: Mymensingh Girls’ Cadet College (boys) and Mymensingh Cantonment Public School and College (girls), Mymensingh. c. Address: Principal, Mymensingh Girls’ Cadet College, P/O:Mymensingh Girls’ Cadet College, Mymensingh-2200. c. Address: Principal, Comilla Cadet College, P/O: Comilla Cadet College, Comilla-3503. c. Address: Principal, Feni Girls’ Cadet College, P/O: Feni Girls’ Cadet College, Feni-3900. b. Exam Center: Joypurhat Girls’ Cadet College and Bagura Public Cantonment School and College, Bagura. c. Address: Principal, Joypurhat Girls’ Cadet College, P/O: Joypurhat Girls’ Cadet College, Joypurhat-5900. 1. Prepare a color Photograph (Dimension 180x210 pixel JPG format within 200KB) and Save any location your computer. 3. Go to 'Home Page' Click Menu 'Admission'. 4. Welcome to Cadet College Online Admission System 2018 at click 'Creat New Application'. 5. Tick Mark at 'I agree with the Terms & Conditions' and then click 'Next'. 6. Fill information carefully 'Personal Information', Educational Information, Family Information, Guardian Information, Contact information, Preference information and Exam Medium & Center. 7. After finish your application show Application ID and Password. Please not this Application Id and Password. It's need to pay fee and Admit Card Download. Cadet colleges Admit Card can download 11/11/2017 to 25/11/2017. a. 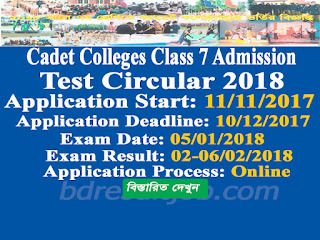 Visit: https://cadetcollege.army.mil.bd/admission/admission-index.php and Click the 'Print Admit Card'. Cadet colleges admission exam date adn seat plan are mension Admit Card. Also you can see Cadet colleges official site https://cadetcollege.army.mil.bd/admission/admission-index.php. Cadet College Official Website: www.cadetcollege.army.mil.bd. 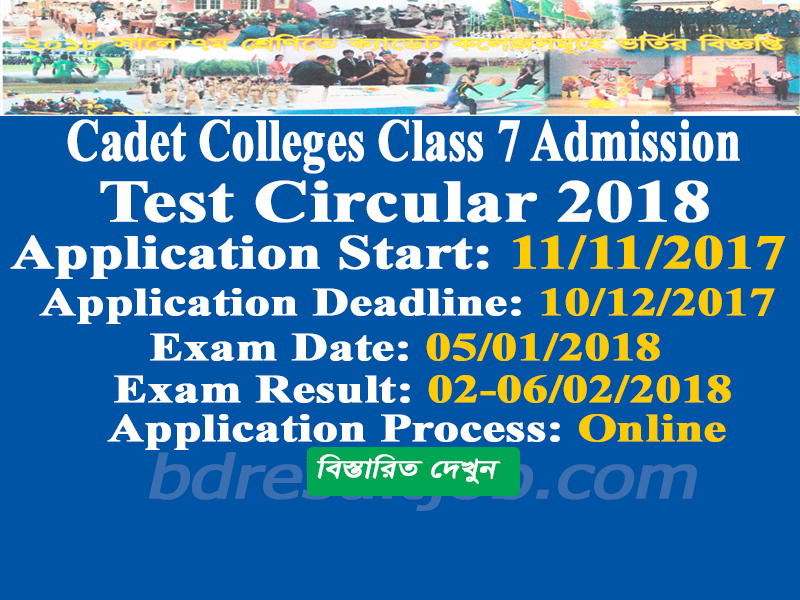 Tags: www.cadetcollege.army.mil.bd, www cadetcollege army mil bd, Cadet College Application Online, Cadet College Exam Center, Faujdarhat Cadet College admission Circular 2018, Mirzapur Cadet College admission Circular 2018, Sylhet Cadet College admission Circular 2018, Barisal Cadet College admission Circular 2018, Mymensingh Girls’ Cadet College admission Circular 2018, Feni Girls’ Cadet College admission Circular 2018, Jhenidah Cadet College admission Circular 2018, Rajshahi Cadet College admission Circular 2018, Rangpur Cadet College admission Circular 2018, Pabna Cadet College admission Circular 2018, Comilla Cadet College admission Circular 2018, Joypurhat Girls’ Cadet College admission Circular 2018, Faujdarhat Cadet College admission Result 2018, Mirzapur Cadet College admission Result 2018, Sylhet Cadet College admission Result 2018, Barisal Cadet College admission Result 2018, Mymensingh Girls’ Cadet College admission Result 2018, Feni Girls’ Cadet College admission Result 2018, Jhenidah Cadet College admission Result 2018, Rajshahi Cadet College admission Result 2018, Rangpur Cadet College admission Result 2018, Pabna Cadet College admission Result 2018, Comilla Cadet College admission Result 2018, Joypurhat Girls’ Cadet College admission Result 2018.